A now veteran Everett squad will look to take advantage of St. John's Prep's youth. Photo courtesy of ESPN Boston. Ed. Note- Our Massachusetts football guru John Sarianides is back with five games to watch during Week 3 of MA high school football. Here are the biggest games of the week. I think it is safe to say that people in the state of Massachusetts overlooked the Rams after graduating one of the best classes in program history. That appears to have been a mistake, because Marshfield beat Cranston West (R.I) 47-7 to start the season, and last week they beat a good Stoughton team. There is no question that will be a tough task for the Rams, as Falmouth is undefeated and talented, but if the Rams execute their Spread Wing-T offense and slow down Falmouth’s rushing attack, they can win this game. Either way you look at it, whichever team controls the line of scrimmage will win this game. On paper, BC High is the better team and they should win this game, right? The Eagles have had two weeks to prepare and are still riding high after Junior running back Danny Abraham’s performance in week one’s win over Andover. All of that is true, but don’t discount the Blue Devils in this game. They have a veteran defense and one of the best quarterbacks/play makers in the state in Noah Gray. They can play with BC High, and they’ll give the Eagles problems defensively. Leominster coach Dave Palazzi is one of the best play callers in the state. He’ll keep BC High’s defense off balance and, in turn, keep the Blue Devils in the game. I think this will be a tight game throughout. It’ll come down to the wire. Catholic Memorial coach Dennis Golden knows his team is getting better, but they need a statement win to prove it. Tonight could be the night. Brockton enters tonight’s contest at 2-0 but they survived an overtime scare last week against Weymouth, so they are not exactly coming into this game with momentum. The Knights, on the other hand, pasted Vermont powerhouse Hartford High School 34-6. After losing a heart breaker to St. John’s of Shrewsbury, the Knights are playing much better. Whenever you play Brockton, it’s about stopping their ground game. If CM can get the Boxers into second and third and long situations, they’ll make it awfully tough for them to score points. Offensively, the Knights have to strike early and carry the play. Force Brockton to have to throw the ball. This game will be a fist fight in a phone booth. Expect both teams to try and pound the ball. It’ll be a 14-12 type of game. This game could very well determine who wins the Davenport Division in the Hockomock League. Stoughton is coming off of a tough loss to Marshfield, but the Black Knights can pound the ball out of their Pistol Wing-T offense. The Red Rocketeers will have their hands full with Stoughton’s talented trio of running backs, Ryan Sullivan, Izon Swain-Price and Justin Ly. All three have the capability to break a long run and score. North Attleboro will have their hands full with Stoughton’s offense, but the same can be said for the Black Knights, who will also have their hands full with North’s trio of play makers. Quarterback Chad Peterson and running backs Bobby Mylod and Nick Rajotte are the centerpieces of North’s Spread Wing-T offense, and all three are capable of changing the course of a game on one play. Part of me wants to predict a shootout, but having coached against both programs through the years, there is no way, because both teams play great defense. 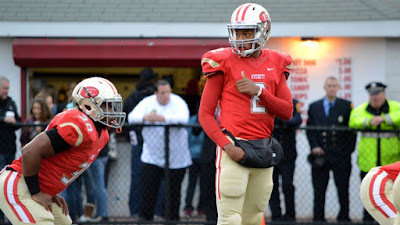 Everett fully understands the position St. John’s Prep is in, because they were in the same position last season. It’s tough to consistently win games when you are so young. Prep is going through some growing pains, but don’t feel too bad for head coach Brian St. Pierre’s squad. There is plenty of talent on hand, led by the Rockett brothers (Wes and Hayden) and Declan Burt. The Prep will give Everett all they can handle, but the Crimson Tide’s speed and athleticism might be too much for the young Eagles to overcome.